19 : November : 2010 : Neis One! Small add-ons to “How did you contribute …”? 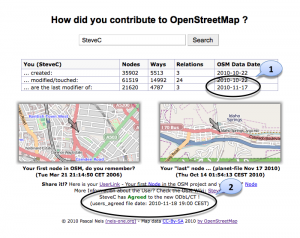 Because of the upcoming license discussions, I made some small additions to the “How did you contribute to OpenStreetMap?” website. First (1) I imported a new planet dump file dated 11/17/2010. Additionally the user can get the information now if the OSM contributor has agreed to the new ODbL/CT, indicated by a green “Agreed” at the bottom part of the page. 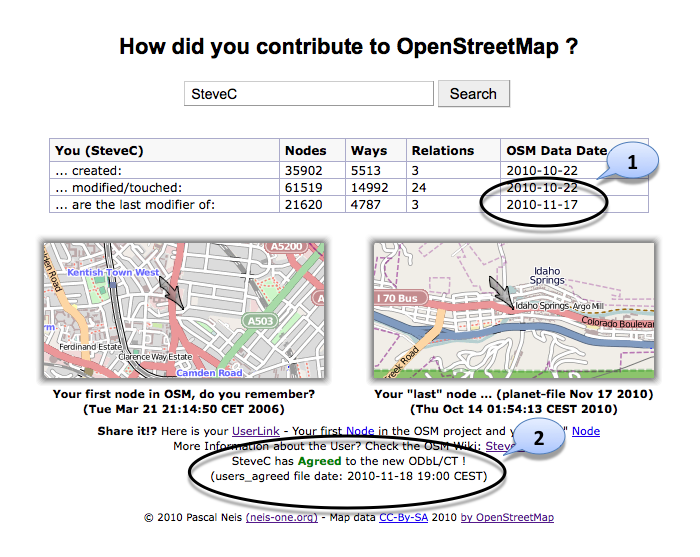 If the OSM contributor has not agreed to the new ODbL/CT yet, it’s showing a different message (3), requesting the contributor to review and accept the new ODbL/CT here. I hope that helps and please remember: If a contributor has not agreed to the new license yet, it could imply that he/she does not know about the license changes so far!